What a sog-fest of a weekend! Several spots in New Jersey exceeded 3 inches of rain, with only short breaks of rain-free weather along the way. Meanwhile, the clouds, rain, and on-shore flow kept temperatures cool. With a high of 61 degrees at Newark Airport on Sunday, it was the coolest day since May 19th. The rain continues on this Monday morning, fueled by the remnants of Tropical Storm Gordon. The center of that storm system — and the heaviest rain — is passing well north and west of New Jersey. But obviously, we're close enough to continue the wet weather for now. A Flood Watch is in effect for almost all of New Jersey until late Monday night, with 1 to 3 additional inches of rain possible. Radar shows the bands of rain are already breaking apart in South Jersey, and we should enter "mostly dry" weather by late morning or early afternoon. Don't get used to it though, as another round of scattered showers and thunderstorms may fire up again by Monday late afternoon into the evening hours. Also don't expect much (if any) sun at any point Monday, although temperatures should become a bit warmer. Most of the state should see 70s by Monday afternoon — I could see far North Jersey getting stuck in the 60s again, and perhaps a couple of 80+ degree readings to the south. Both temperatures and humidity will continue to climb Monday night, with thermometers again generally in the 70s. Additional showers and/or fog will probably dot the state overnight. Another period of rain is likely for the middle of the day Tuesday, as high temps make a run for the lower 80s. As showers wrap-up Wednesday morning, I'm hopeful we'll see breaks of sun by the afternoon. That will push temperatures even warmer, into the lower to mid 80s. I've even seen one model suggest 90. Ha, and you thought summertime heat and humidity was over?! 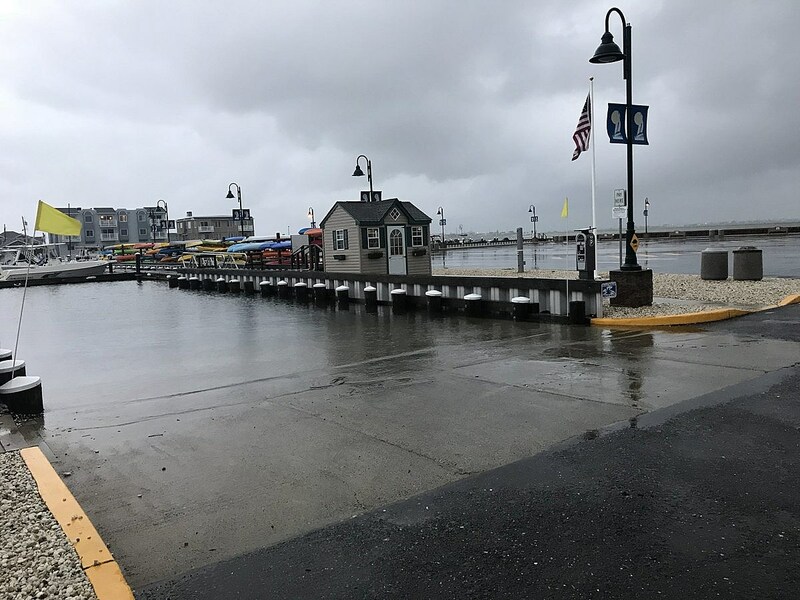 A Coastal Flood Warning remains in effect until at least Monday afternoon, as another round of moderate to major tidal flooding is possible at high tide. This warning includes the Delaware River, Delaware Bay, Atlantic Ocean, and Raritan Bay, along with all back bags and tidal tributaries. I think the worst push of water is behind us, during Sunday night's high tide. However, 1 to 2 feet of surge could lead to saltwater inundation issues in low-lying areas, in the moderate to possibly major category. I am also concerned about the back bays in particular, which have not had an opportunity to fully drain after several consecutive swollen high tide cycles. Beware of road closures due to high water. Never attempt to drive, walk, or swim through flooded waterways. 6 to 10 foot waves are expected along the oceanfront Monday as well. A high risk for rip currents will lead to red flags at all NJ beaches. By the way, this coastal surge is only minimally linked to Hurricane Florence. The prominent east-northeast flow is driving the rough surf and high water conditions. However, it's certainly possible that Florence's swell is partially affecting the Jersey Shore already, even from 1,300 miles away. As of this writing, there are three hurricanes lined up across the tropical Atlantic Ocean. 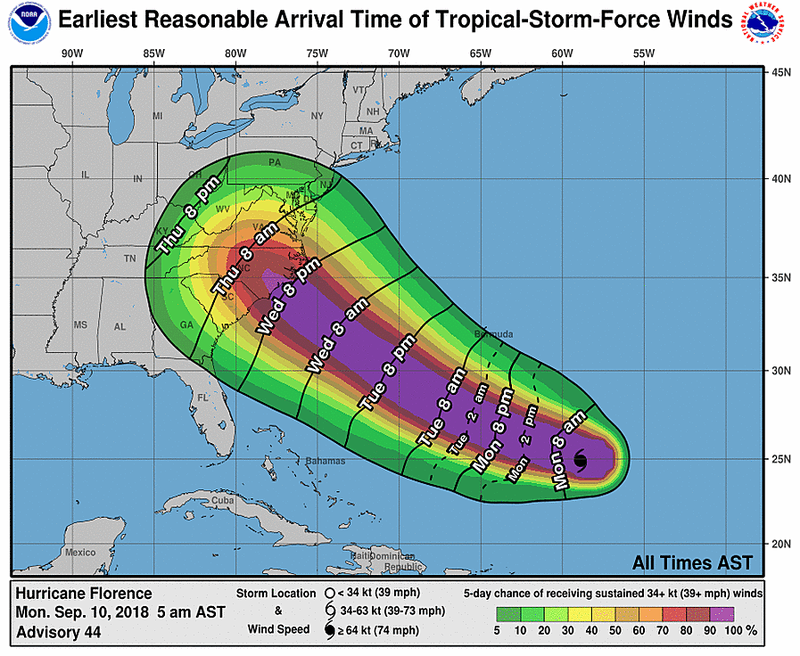 Florence is the immediate concern for the U.S. East Coast, while Isaac eyes the Caribbean and Helen meanders out-to-sea. All forecast models are now pointing Hurricane Florence toward a landfall around North Carolina later this week. As of 5 a.m. Monday, Florence has intensified to a strong category 2 storm, with maximum sustained winds of 105 mph. As rapid intensification continues, winds are expected to climb to about 150 mph by early Wednesday morning — category 4. There are still some nuances in the intensity and track forecast, but residents of North Carolina (and South Carolina and Virginia) should be very concerned about the damage and death potential of this storm. 1.) 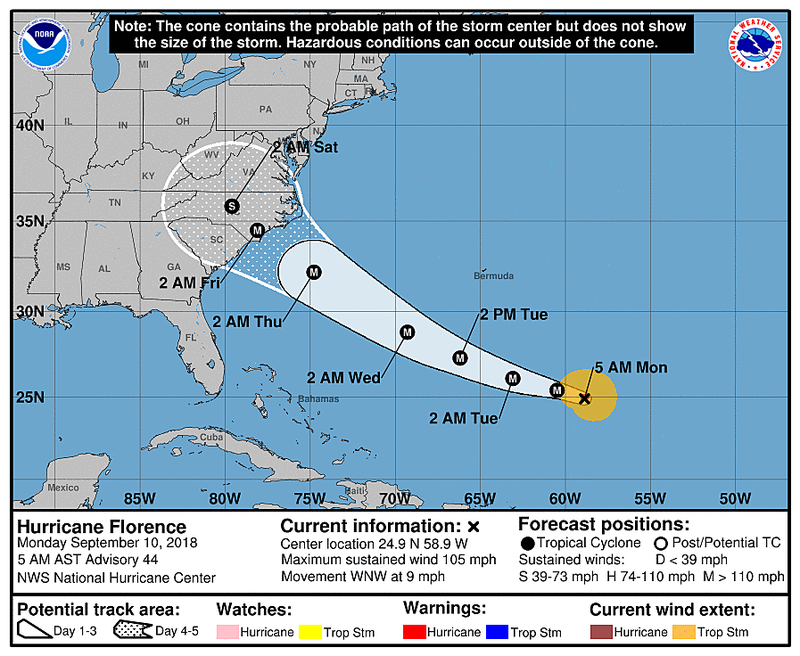 A North Carolina landfall is close enough for the outer bands of Florence to clip South Jersey. Tropical storm force winds and a bit of rain are possible around late Thursday into Friday. 2.) Heavy surf is almost a guarantee for the Jersey Shore. Surge models are only reliable to about 3 to 4 days, so we'll get more clarity and detail on this by Tuesday. 3.) 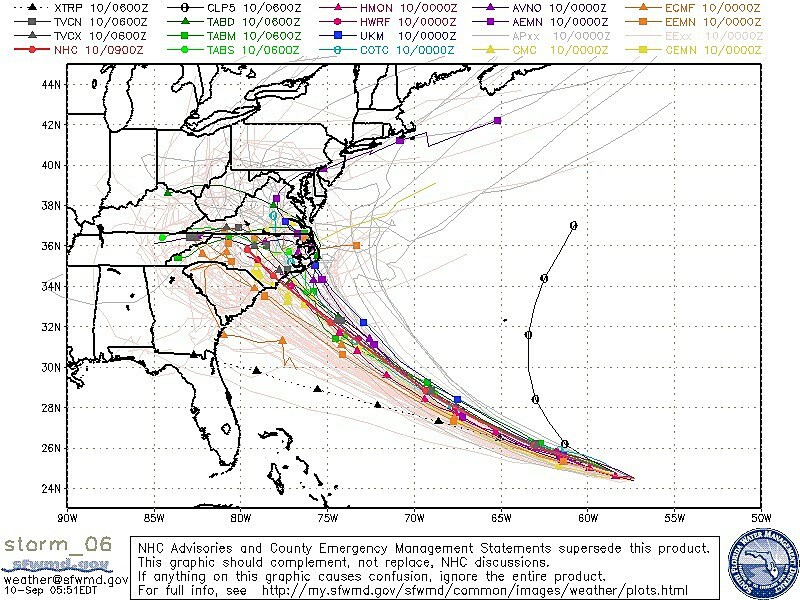 There are still lots of question marks about where Florence tracks after landfall. 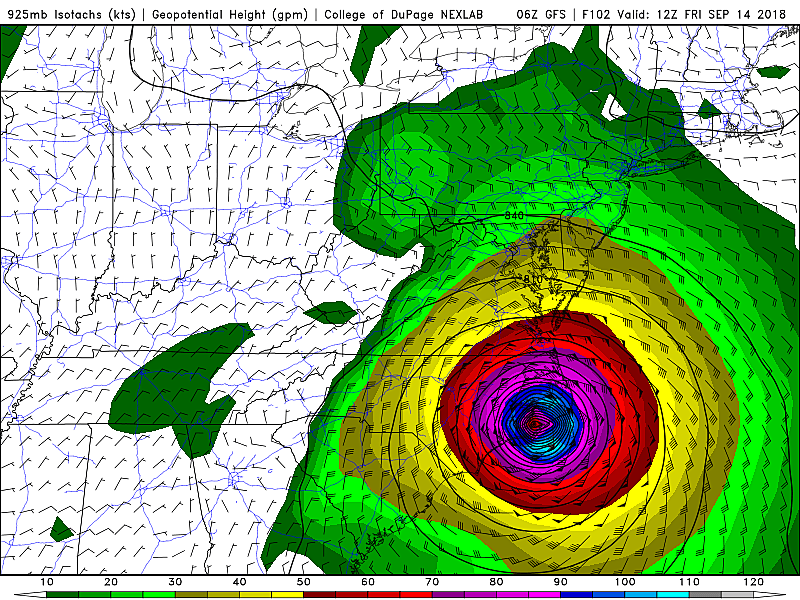 In Sunday's weather blog, I gave you three options of what happens next after a Carolinas impact: Kiss and Run, Coast Hugger, and Inland Explorer. Both the operational GFS and Euro (among several other models) now depict the inland track — Florence makes landfall and keeps pushing west. In this scenario, we would see limited rain and a brisk wind in New Jersey through the upcoming weekend, but hopefully nothing damaging or truly life-threatening. As I mentioned above, however, the surf and surge threat could still be significant. Still worth watching as the week presses on. Next weather blog update expected by 7 a.m. Tuesday.